I’ve always been a bit of a collector. As a kid growing up in Levittown, I spent my days with comic books, mostly DC because their stories ended without having to buy the next one. Then as a teenager it was vinyl records. Album cover art, along with liner notes and studying lyrics, has gone the way of the dodo when you download music. In my twenties and thirties I moved to art books, limited edition posters, and concert ticket stubs. But those things were all transitory. All that has changed since I hit fifty. Now I collect something that will last the rest of my life. New and mysterious aches and pains I never had before. I joined, or rather was signed up for, the Aged of the Month Club. Each month a new area will suddenly show up red and inflamed where once was pink and baby soft. February: a cornucopia of skin blotches, barnacles, and breakouts. Just in time for Valentine’s Day! Oh joy! September: Congratulations! It’s a new allergen. Go rake some leaves and take a deep breath so the mold really gets in there. For November, I woke with my newest collection, repetitive motion injury in my drawing elbow. (And at a time when my career could suddenly blossom like an Outback Steakhouse onion.) So I needed to make some adjustments to my workstation and I haven’t been able to ride my bike. But, like the apartment dog that I am, I still have to get outside once in a while. So I have switched to trail hiking. At first I was a little bummed not being able to ride, but the nice part is I can take our dog with me, who seems more than willing to go. It has also given me a different view of the area. Even now, with the grasslands dead from the cold, they are still beautiful. The jet black cows that pepper the golden fields stand out strongly against the deep blue sky. We walked along a marsh where cottonwoods and cattails grow. In the underbrush unseen birds were chirping away when suddenly a flock of red winged blackbirds took flight. On our latest trek we spotted a coyote hunting around for a meal. He was only about fifty yards away and as graceful as any animal could be. He looked at us a few times but didn’t seem overly concerned and neither were we. The gravel crunched under my footsteps and the sound reminded my of my dad. For each morning he would have his bowl of Frosted Flakes. My dad was a creature of habit, something that was simultaneously reassuring and exasperating. But because of that repetitiveness that memory has stuck in my head and it makes me smile out here in the cold. I guess we all become collectors of a sort as we grow old. Whether on a long walk, or sitting with my elbow propped up to rest, I can spread my memories out like a collection of old comics across the floor and dive in. This Thanksgiving I am grateful for all my friends and family members that have given me something warm to think about on a cold November day. Fall back, spring out an open window. Marriage, or as I refer to it a government sanctioned Stockholm Syndrome, is never easy and at times challenging. Anyone who says they have a perfect marriage and never fight are either liars, heavily medicated or both. And marriage is not the same as living together, no matter what a morning news show is telling you. You can learn to live with almost anyone; friends, parents, kids, sexual partner, salesman, but making decisions and compromising, well that's a whole different wild animal my friend. For instance, we had to buy a new bed for our dog, Daisy, because she didn't like the one she had. I find this odd because she never said a word. And I didn’t even place in this argument. The bed had to be a special ordered one with her name embroider on it. Daddy’s little cur is over twelve years old now. With my luck it will curl up and die before we get it out of the box (the bed that is) and I’ll end up having to name our next dog Daisy just so I can get my money's worth out of the bed. A simple thing like setting our clocks back, as we just recently did, could be an innocuous task. But do not jump to conclusions my friend, especially when we have an extra hour to do so. All sorts of emotions, desires, animosity, longings can surface at such times. Enclosed is a sample of my conversation with my dear wife at one am, the morning of the event. I purposely removed our names since it is really pointless which side of the time continuum fence you are on. Although, anyone who has meet me can tell in the first five minutes how uptight I am and my responses. 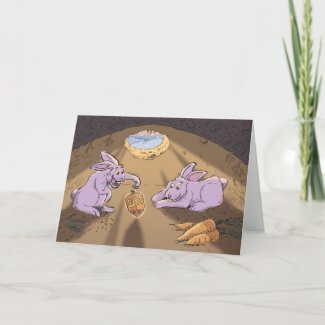 I've added several new cards to my Zazzle store if you are in the market. Zazzle is a pretty neat place to make customised products. Millions of styles available. Of course this shameless promotion will most likely generate a ton of cash for people I've never meet and probably will never send my royalty check of $4.23, but my website guy tells me to do these things. I didn’t write anything the last two weeks because of the elections. I’m struggling with the notion of whether to put anything political on this blog. However, after being inundated for the past month with ads stating everything from the ridiculous to the utterly ridiculous and pundits on “news channels” telling me how I feel, I am about ready to scream. I just want to make two brief observations then I’ll shut the hell up. First off, to me this election wasn’t about saying no to this president or spending or healthcare. It wasn’t about the need to go back to those pretend halcyon days of President Bush. The election boils down to this. I believe the American voter was saying: “I’m pissed off at the government for wasting time, my money, and resources while I’m struggling to get by. If I have to be out of work, then guess what? I’m putting you out of work.” It’s our one chance to say FU. But saying it always comes with consequences. The government has become a dead leviathan beached in our backyard and starting to rot. Should we expect anything else? Would any normal person go into a profession where you spend millions and millions of dollars to make the other person going for the same job look like a criminal? This brings me to my second point. I’ve been on countless job interviews and not once did it cross my mind to sabotage the other people going for the position. I just figured that person had different skills or experience or maybe at least was a relative. Can you imagine if every career treated potential employees this way? Teachers, pilots, janitors all vying and undermining their colleagues slash opponents while having a smile a used car salesman would envy. What kind of person are we hiring? We are producing an industry of small-minded narcissists with deep pockets to run this great country of ours into the ground, leaving little for our children. Well, I guess you can tell by my tone that I am not only annoyed but over fifty with too much time on my hands. So it’s back to the drawing board. Next week I promise to get back to a lighter fare. Please leave your comments. I loved to hear how wrong or right you think I am.